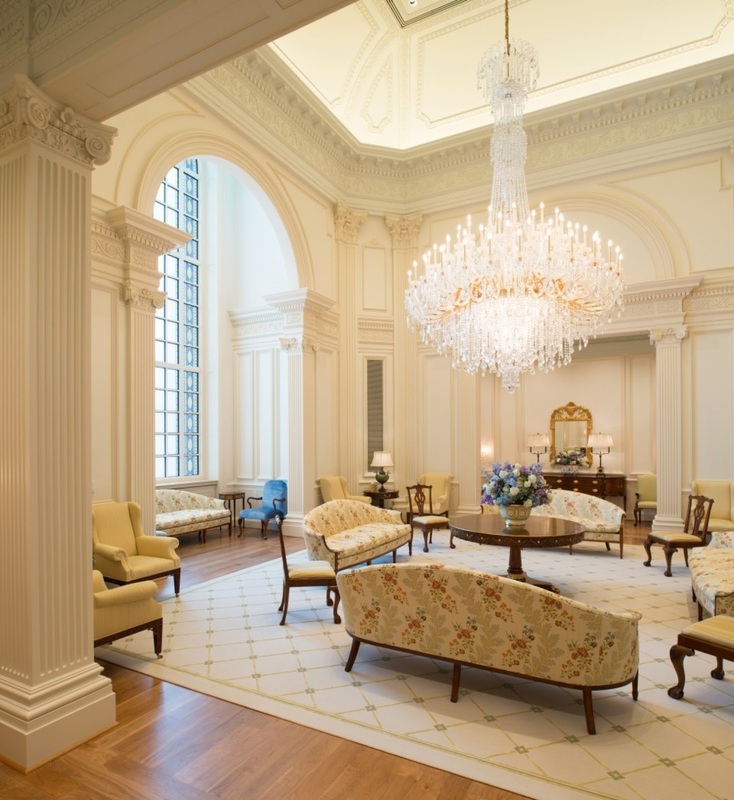 I don’t remember how I found out that there was a new Mormon temple in the Philadelphia, but my eyebrows arched immediately when I heard the news. I’ve driven by the Mormon temple on the Washington beltway a bunch of times, and each time I go by I wish I’d been able to check it out. You can’t just visit as you would any other place of worship; Mormon temples are only open to non-Mormons for a short while before they’re consecrated. After that, if you want to see it, you have to become a Mormon, down to right down to the eschewing caffeine and booze and wearing the special underwear. I wasn’t going to miss my chance as what realtors call a “looky-loo” and right from the start, I'd ruled out religious conversion in order to get a look. Accordingly, I took a break from enjoying the sun and surf of Stone Harbor NJ (“The Seashore at its Best”) to drive to Philadelphia to check the temple out. Yes, it was difficult to tear me away from making sure that my beach tag was pinned to my swimsuit, that there was air in my bicycle tires, and that I walked past The Fudge Kitchen after dinner every night for my free sample of rich, creamy fudge. The sacrifices I make for my blog! I called my friend Martha see if she’d join me, but she’d already been and wasn’t up for a reprise of the experience. She told me that there were scads of volunteers and parking would be a breeze. I’m not sure how many stars that translates into on Yelp, but presumably it’s more than zero. Martha told me I’d have to go to the temple’s website to make a reservation for a tour. When I did, I chose a time in midday so I wouldn’t have to sit too long (in theory) in Philadelphia traffic. The website told me that I’d have to print and bring my ticket with me or have it available on my phone. And to dress modestly, too! In other words, don’t dress for a Kardashian-ready red carpet scene hosted by the panelists on E!’s Fashion Police. I have only a very limited experience with Mormon-themed tourism. Many, and I do mean many, years ago my friend Pat and I visited the Joseph Smith Birthplace, on LDS Lane in Royalton, Vermont. Joseph Smith, as American history buffs know, was the founder of the church of Jesus Christ of the Latter Day Saints, aka the Mormons. 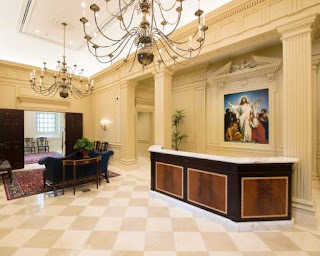 The faithful say that he was the scribe of the Book of Mormon—the one you find in the nightstand of every Marriott hotel—not the Broadway show. The monument features a granite obelisk whose “polished shaft” is 38 ½ feet tall, one foot for each year of Joseph Smith’s life. 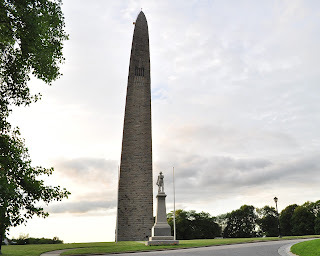 In case you’re wondering...as far as Vermont erections are concerned, Joseph Smith’s is dwarfed by the Bennington Battle Monument, which at 306’ is not quite ten times the high of the Joseph Smith memorial. Oh right, size isn’t everything. And so, on the appointed day, after sitting in a traffic jam on the Vine Street Expressway, I was there, ready for my tour. Martha was correct: parking was a breeze. There were scads of volunteers directing me to the right spot in the garage. Perhaps my modest clothes were a dead giveaway, but no one asked to see proof of my reservation. I have no doubt that operating rooms at the Mayo Clinic are dirtier than that parking garage. I wouldn’t have been surprised had there been a paper barrier on my parking spot informing me that it had been sanitized for my protection. Are all Mormon-operated parking garages as sparkling? A smiling Mormon at every turn directed the crowds from the parking garage to the meeting house across the street from the temple for the start of tours. The exterior of the meeting house looked like a modern-ish suburban church. Inside, it was like every suite of church offices I’ve ever been in, except for newer carpeting, better AV equipment, and no signs about peanut allergies. Smiling Mormons ushered us into a room filled with ten rows of folding chairs. When there were about 20 visitors in the room, two young women, each with a decidedly Stepford-ish mien, introduced themselves to us. They had the not making eye contact with anyone thing down pat. Perhaps they cannot smile and make eye contact at the same time? At the end of their somewhat robotic welcome, they played a brief introductory video, that mostly said, God loves us. We followed our docent out into the hall and down a set of stairs—Martha clued me in that there would be lots of stairs—and out onto the sidewalk where we waited to cross the street to the temple grounds. While were waiting a man walked down along our group handing people a newspaper. He was from Mission to Mormons, an evangelical Christian group that seeks to convert Mormons into evangelical Christians. One of the people in my tour group asked the man who his newspaper was from and he said “It’s from me.” Clearly this wasn't his first rodeo. The smiling Mormons took no notice of him. They just smiled. In fact, all the Mormons on duty were really good at smiling. The special Mormon underwear they're famous for must keep chafing to a minimum. I’d barely had time to look at my paper from Mission to Mormons when it was time to walk across the street to the temple itself. OK, that’s a generous assessment. While the builders get points for trying to respect the architectural and historical context of the site, I wish they’d done something that wasn't quite so literal. I’m not really sure that the clock tower of Independence Hall works when it’s refashioned in granite and plopped atop a building many times the size of anything in pre-Revolutionary Philadelphia. But yes, they did try. In the building’s forecourt we were met by yet another smiling Mormon (I think the count was up to 10) who pointed out the inscription on the front of the temple: Holiness to the Lord The House of the Lord. Smiling Mormon #10 acted as if this were the great American novel, boiled down to nine words, something I just wasn’t getting. I didn’t have much time to not get it, since we were soon directed to walk across the forecourt to a station where we would get disposable shoe covers. I have been on lots of tours where you have to wear disposable shoe covers so that you don’t scratch the floors of the house you’re visiting. They’re standard at the Stone Harbor Garden Club Home Tour. Apparently the conspicuous consumers who open their mega McMansions to garden clubbers and their friends are worried about someone wearing Tory Burch flats tracking Shih Tzu poop into their mega McMansion. Or something. Who knows? However, on the Garden Club Home Tour, you pluck your booties from a tasteful wicker basket on the porch of the mega McMansion you’re about to visit and put them on yourself. At the Mormon temple, there was a crew of smiling Mormons who actually put them on for you. So everyone in my tour group just stood there, leaning on the special bootie donning rail while a smiling Mormon got you kitted out in their special non-fetching white rubber-ish shoe covers. I certainly hope after Labor Day they change the shoe covers to a more seasonally appropriate color. After waiting in line just a little bit more, we were ushered in to the temple itself, where we were met by another smiling Mormon. 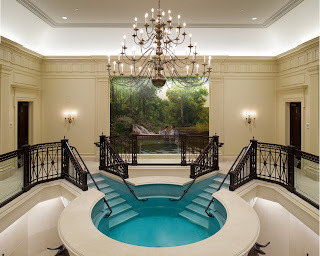 We gathered in the small entrance lobby that looked as if it belonged in a spa decorated in a Vegas inspired version of Colonial Williamsburg, or, as one of my profs used to say, Phony Colony, pronounced in a rhyming fashion. We weren’t allowed to take photos in the Temple so you rely on these publicity photos that the temple management has released. 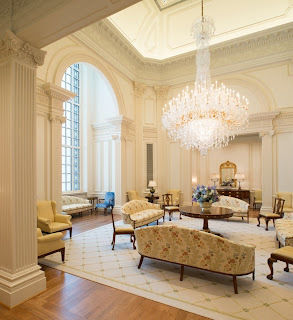 The Smiling Mormon in the entrance lobby was wearing shoe covers, just like every other Smiling Mormon in the temple. I wondered if they’d taken the plastic slip covers off the furniture just for us. I noted there was a painting of the Founding Fathers signing the Declaration of Independence in the waiting area. Had the painting included Joseph Smith, Brigham Young, or any of the Osmonds, it would have been the best piece of religious art this side of the painting of Jesus handing out diplomas in the chapel at Gettysburg College. As it was, it only rose to the level of pretty bad. The smiling bootie-wearing Mormon didn’t mention the painting. I don’t think I’ve ever seen a painting of the Signing of the Declaration of Independence in a house of worship before. 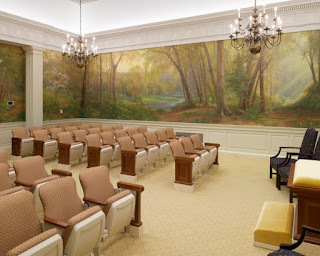 Perhaps this was just a nod to the local culture; if so, the Bayonne, New Jersey temple probably has a painting of the invention of the toxic waste dump. The next stop on the tour was the baptismal font room, or baptistry, also decorated in the Vegas Colonial style. The baptistery was a two story square space, with what appeared to be an eight person hot tub in its center. 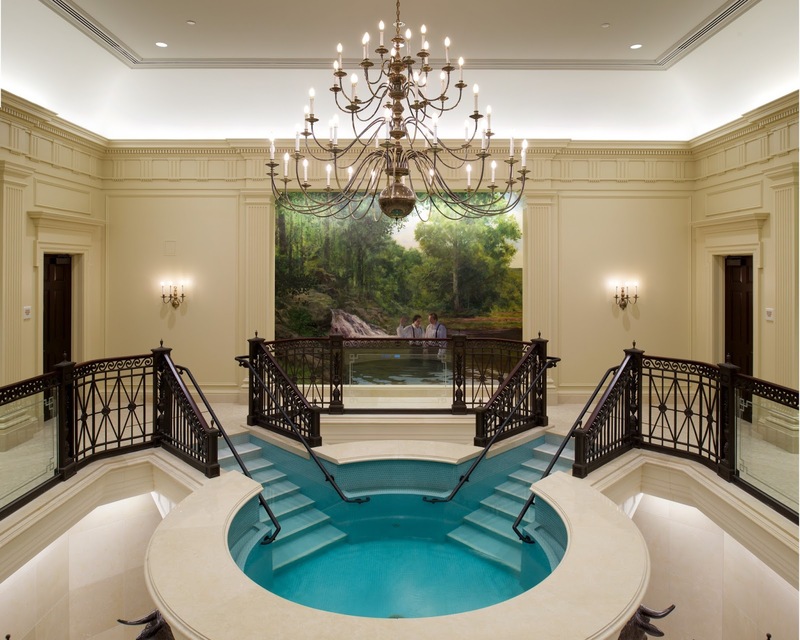 We were at the second floor level of the room and so could stand at the iron railing and look down to see that the hot tub, I mean baptismal font, was supported by twelve life size bronze oxen. 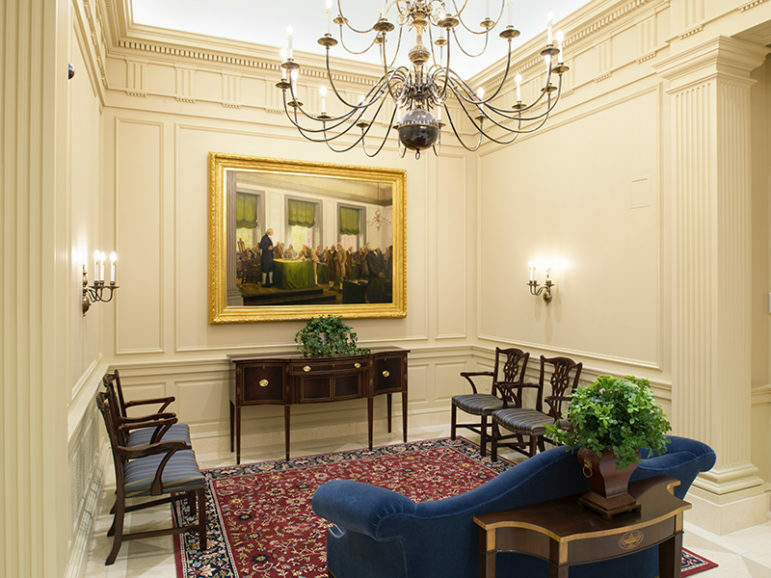 The smiling bootie-wearing Mormon docent in this room noted that oxen symbolized the twelve tribes of ancient Israel. As the above photo clearly shows, the oxen were not wearing booties. There are some more paintings on the wall, including one of two men in 19th dress, in a river, fully clothed. Perhaps the painting depicts baptism, perhaps they were just too embarrassed to go skinny dipping. Who knows? None of the smiling bootie-wearing Mormon docents—and there were enough to create quite a line at Starbucks if they would ever go to Starbucks—ever mentioned any of the art at any point in the tour. The building is filled with what seemed to be reproductions of paintings done in a School of Thomas Kincaid Does the Children’s Illustrated Bible style. If you were thinking our best and brightest artists would be commissioned to decorate the temple the way Pope Julius II commissioned Michelangelo, think again. And keep thinking. Jesus feeding the multitudes with cheesesteaks from Pat’s AND Geno’s. Jesus at the Linc preaching to the angry multitude, Let he who has an all-Eagles fantasy football team cast the first snowball at Santa. OK, those paintings weren’t really there. But they would have fit right in! After the baptismal font, we were shepherded through a bunch of small rooms, sometimes staffed by a smiling bootie-wearing Mormon docent, but mostly empty. There were special locker rooms where men and women would change into their “temple garments”. There were lots of small meeting rooms whose purpose wasn’t readily apparent to this non-smiling bootie-wearing Presbyterian. There were some rooms that looked like small theatres, though curiously lacking the stage. Interestingly enough, there isn’t one grand space, as there is in a church, synagogue, or mosque, and none of the rooms in the place had anything that looked remotely like a church pew. 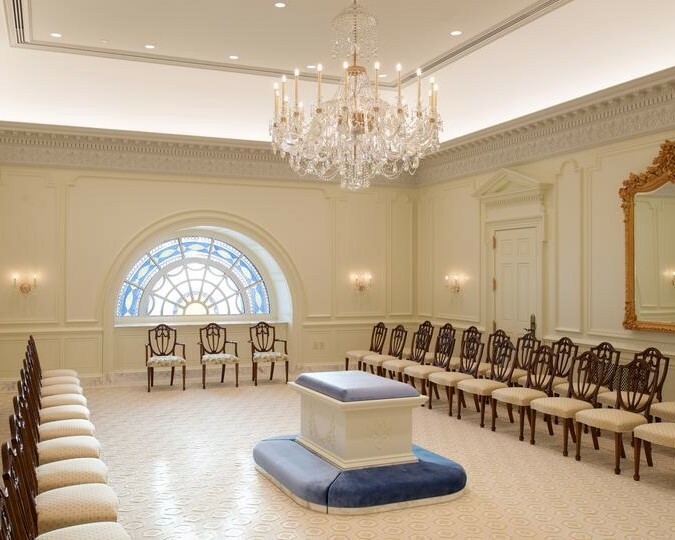 Since there are so many small rooms, all decorated in the Vegas Colonial style, the temple looked like a really nice, brand new, funeral home. Or perhaps a conference center owned by the Mary Kay Corporation. It’s not like any house of worship I’ve been to, and I’ve been to lots of them. The climax of the tour was when we got to see the Sealing Room on the top floor. It held about 50 chairs which were arranged to face each other, as if we were ready for an all Mormon version of the game show, Family Feud. There was an electric organ in the corner of the room. I remembered my friend Kathleen’s 18/36 rule for visiting her parents. Fewer than 18 hours was too short, more than 36 hours was too long. Eternity, even if during much of that time you are technically dead, well, that’s just beyond the pale. After, or perhaps before the Sealing Room, my memory is hazy, we also got to see the extra special Celestial Room. It’s decorated in the Even More Over the Top Vegas Colonial Style. This style is also known to shelter mag readers as Liberace Does Colonial Williamsburg. The room—capacity 80, according to the fire department—is for sitting and having deep thoughts, of which, I was fresh out. I did note that an arm on one of the super fancy crystal sconces was broken. Apparently shoe covers can’t prevent all accidents. At least no Shih Tzu poop was involved. Once we’d done the Sealing Room and the Celestial Room our tour was over. We were invited to go to the visitors’ center next door—no booties required. There was no gift shop—not even a pop-up, and of course, no coffee shop. I did the jiffy tour of the visitors’ center. There were no story panels about the building, its construction, the people who built it, or even about the LDS church. There was no model of the building or even a souvenir book. There was a time lapse video of the building’s construction, which I skipped. There was a large sculpture of Christ, which looked surprisingly out of place given the lack of religious imagery--at least that I recognized--on the tour. Instead, I focused on the sample boards that gave visitors a model home-esque look at color swatches, a sample of the carpeting—made in China, btw—and various moldings. Of all the million and one things that could tell the story of that particular place, I was astonished that they chose some sample boards with color swatches. When it was all said and done, I didn’t learn much about the Mormon faith. In fact, I’d hardly learned anything about it. For a faith community so practiced at proselytizing, that was a shock. None of the smiling bootie-wearing Mormon docents said much about the essential tenets of the faith though they tried to answer the few questions from the folks on our tour. There was more information about the LDS church in the newspaper that I got from the evangelical anti-Mormon than any of the smiling bootie-wearing Mormons provided. Likewise, I didn't learn much about the Mormon temple. The smiling bootie-wearing Mormons dished out even less information about the Temple building than they did about their religion. If I wanted to know that the exterior was clad in granite quarried in Maine but finished in Canada, I’d have to look elsewhere. They even skipped the details on the unique symbol of their faith, the statue of the angel Moroni statue atop the place. In case you’re wondering, it’s 21 feet, 2 inches tall, made of fiberglass, and covered with gold leaf. The tour was light on information, but heavy on smiles. I didn't know a whole lot more than I did before I took the tour, but I did get to see the interior of the temple, and that was the whole point of the visit. My one regret is that I didn't ask someone about Mormons not drinking coffee. Oh well. I couldn't stand that much smiling in the line at Starbucks anyway. I took the same tour of the temple in Belmont, Ma. when it was built. It looks the same as that one! About as un-spiritual (unspirational?) as you can get, imho. More like an expensive, upscale Sheriton Inn or something. No soul at all! Hey, but at least it's all paid for! No mortgage on that puppy! Looks like they'd benefit with you as a docent, covering those overlooked details. First of all, I wish I had known you went because I live a couple of blocks away. But had we gone together, we probably would have been kicked out for giggling. The biggest question I had after touring was how the heck (oops) you can baptize someone who's dead. Even after the tour, the Mormon faith--including the baptism of your ancestors in the big ole hot tub--remains a mystery to me.